What is a standard equation of a circle? How to find the equation of a circle? How to use this equation of a circle calculator? You might already be proficient in the geometry of a circle, but seeing the equation of the circle still makes your head spin. If this is the case, don't worry! This standard equation of a circle calculator will help you determine the radius and the center coordinates in a blink of an eye. If you are curious how to find the equation of a circle, scroll down, and you'll find the explanation of the formula. If the geometric shape you're trying to analyze looks a bit squashed, it's probably an ellipse. In such a case, head straight to our ellipse calculator! (x, y) are the coordinates of any point lying on the circle. It means that as long as you know all of the constants, you can input any x value to figure out the coordinates of an arbitrary point on the circle. (A, B) are the coordinates of the center point. Be careful about the + and - signs here; for example, a circle with an equation of the form (x - 3)² + (y + 3)² = 5² will have a center point at (3, -3). r² is the radius of the circle, raised to the power of two. To find the radius, simply take a square root of this value. Our equation of the circle calculator finds not only these values, but also the diameter, circumference and area of the circle - all to save your time! α is the parameter - the angle subtended by the point at the circle's center. Again, you should be careful about the signs of the center point. Here we are! That's the standard equation of a circle. OK, you've learned about different circle equations. But where are they come from? Let's find out! Choose the center (A, B) of your circle. Don't put it in the origin of the coordinate system. Draw a circle with a chosen radius r.
Pick any point on the circle. Assume the coordinates of that point P are (x,y). The angle POC is equal to α. Two last equations represent the parametric equations of the circle. 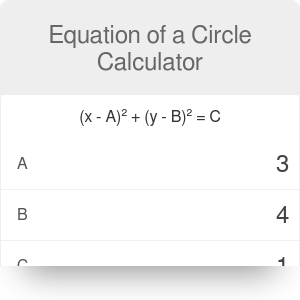 Now as you know how to find the equation of a circle, give this calculator a try! This is the general form of a circle equation - the same as the standard form, but expanded. It is possible to get to the standard form from here with just a few simple operations - all you have to do is follow the steps below! You're done - this is the standard form of a circle with a center at (-2, 3) and a radius equal to √5. Naturally, you don't have to go through this whole process by yourself. Use this equation of a circle calculator instead! If you are still unsure how to use our tool, have a look at this simple example below. Assume you want to use standard equation of a circle. So it's the first part of the calculator. Type the given data. 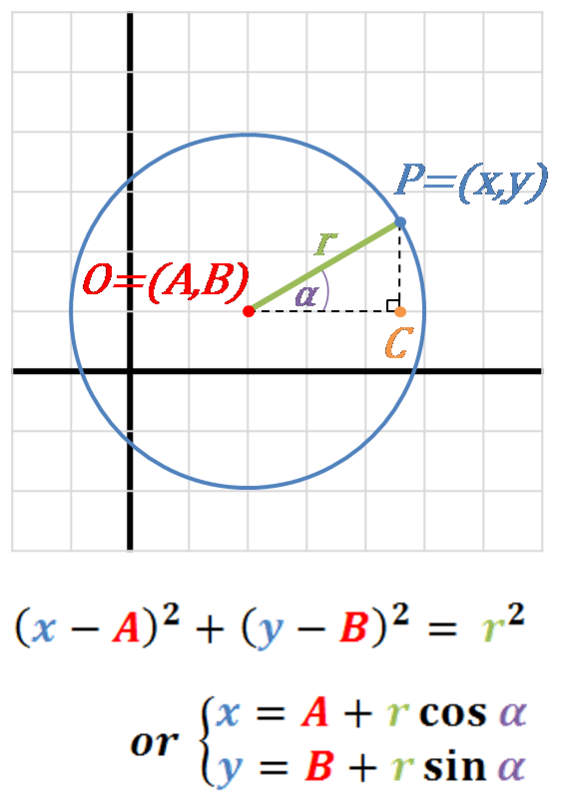 Let's say that your equation of a circle parameters are equal to A = 7, B = -2 and C = 9.
circumference of the circle is equal to 18.85. In this calculator, we didn't put any units, as in many cases you don't need them, because you're working with the coordinates. If you need some units - like, e.g. inches, feet, or centimeters - just add them to the obtained results. Don't forget that the circle area will have squared units of length! Equation of a Circle Calculator can be embedded on your website to enrich the content you wrote and make it easier for your visitors to understand your message.